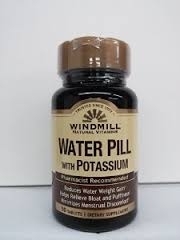 Windmill™ Water Pill - 50 tablets with Potassium is a natural herbal blend, it helps promote a balanced level of fluids when used in conjunction with a healthy diet and exercise program. Free of artificial colors, flavors and preservatives. Windmill is a trusted name that has been providing America with quality supplements for over 40 years. Take 1 tablet with meals as a dietary supplement or as directed by a healthcare professional.